Get it? "The monster" isn't the monster! The Monster, the third and latest film from writer/director Bryan Bertino, is one of these horror movies that might disappoint horror fans despite being a pretty good movie. This is because it's much more interested in being a relationship drama than the full-blood horror movie its title and cool practical creature effects would suggest. Yes, there is a monster in The Monster, but the real monster in The Monster is metaphorical. Your patience for this may vary. Zoe plays Kathy, the young, unwed, alcoholic mother to pre-teen, wise-beyond-on-her-years Lizzy (Ella Ballentine). The two don't like each other; Kathy resents having to take care of Lizzy and recognizes that she is unfit to do so, while Lizzy resents having to be the adult in their relationship. While driving to take Lizzy to her father's house -- from where neither mother or daughter expect Lizzy to return -- they get into an accident on a dark and deserted highway. While waiting for help, they find themselves trapped, stalked by some sort of creature intent on killing them both. The Monster finds Bertino returning to the type of horror film with which he first made his name in 2008's The Strangers (a movie I have, full disclosure, avoided watching until this week). 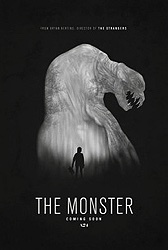 Both his debut and The Monster are movies in which the horror elements are an extension of the emotional strife his characters are experiencing -- the dissolution of a relationship in The Strangers and the separation of a mother and daughter here. Through a series of flashbacks interspersed throughout the narrative, we see that the dynamic between Lizzy and Kathy has always been toxic, not helped at all by the presence of Kathy's terrible boyfriend (Scott Speedman, reuniting with the Strangers director for a cameo). The willingness of both Bertino's writing and Zoe Kazan's raw performance to portray a kind of helpless self-destruction -- to admit that having a kid does not make one fit to be a parent -- turns The Monster into an emotional gut punch even without a creature showing up. Ah, but a creature does show up, and Bertino deserves credit for how he handles that as well. The (literal) monster remains an offscreen threat for most of the film, waiting in the shadows and stalking its prey. The cinematography by Julie Kirkwood creates endless dark spaces in which anything could be hiding and both Bertino and editor Maria Gonzales demonstrate real patience when it comes to how long they're willing to let some of the sequences play out -- particularly one involving a tow truck driver who stops to give the ladies some assistance. Ultimately it ends up being pretty standard monster movie stuff, but handled with a degree of professionalism that elevates it just enough to be worth seeing. It's the emotional elements of The Monster that give it weight, though. As a portrait of an abusive relationship between a fucked up woman and her neglected daughter, it's often very powerful. As a horror movie, it's just ok. But by weaving such human drama into a genre film once again, Bertino has reclaimed some of the success he found with The Strangers (a movie I can acknowledge as being very effective while still being something I don't really want to see again). After the massive disappointment of Mockingbird, his second feature and one of many truly bad found footage movies released in recent years, it's nice to see Bertino getting back to the specific space he seems to be carving out for himself within horror. His better efforts remind us that it's easier to scare us when we care about the people involved, and that sometimes our own ability to hurt one another is scarier than any masked intruder or roadside monster. Oh! "The Monster!" I just got that. I was totally sold with the performances in the beginning and was hoping that the entire film continued to be that strong and the characters would develop throughout. Halfway through, however, the film just hit a wall. The practical monster was cool but I just felt like I was more interested in their relationship than where the movie was going. I thought it was ok, but definitely not what I was expecting. Comparable to ordering a steak and receiving a pork chop. Both leads are very good but I'm not sure where I stand on the monster. Practical effects are almost always the best choice, but this made me think of the monster from Forbidden World. I thought it was interesting how they handled some of the typical horror tropes. They actually had cell phone service and "mild spoiler" they actually receive significant assistance from outsiders.